These cookies are the perfect way to end the week. Dark cocoa wrapped around melting marshmallows...like potato chips, it's hard to have just one. Cream together butter and sugars. Add in egg and vanilla. Carefully add in cocoa (it likes to fly everywhere). Gradually add in remainder of dry ingredients. Fold in chocolate chips. I used a .5 cookie scoop and filled it slightly over. 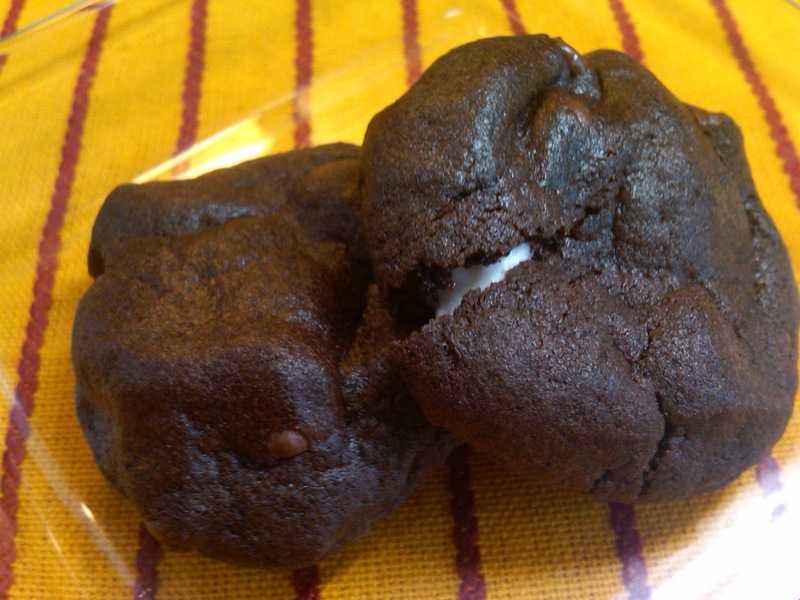 Press in two frozen marshmallows and wrap the chocolate dough around them. Place on a parchment lined baking sheet. Bake at 325° for about 12 minutes. mmmm, these look mouth-wateringly delicious! Wow! Mouth watering recipe. I love it and thanks for posting such a nice recipe. Then Click for fnm.